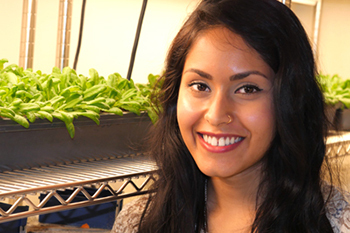 Snigdha Chatterjee ’17 has received two prestigious awards from the American Society of Plant Biology (ASPB). She was awarded both a travel grant and a Summer Undergraduate Research Fellowship. Between the two awards, Chatterjee is supported to travel to the society’s annual meeting for the next two summers, as well as perform research during the summer of 2016. The Summer Undergraduate Research Fellowship will support Chatterjee’s further investigations into epigenetics and plant disease responses. The fellowship, which was awarded to only 15 students this year, provides a stipend, funding for research supplies and additional travel funds for ASPB’s 2017 conference in Honolulu. Chatterjee, a native of East Syracuse, is working on majors in biotechnology and biophysical science, in addition to a minor in chemistry. She has been with the Raina Lab since her freshman year. “He asked me about research and I had told him that I was interested, but did not know where to start,” she says. Raina then offered her a position is his lab, which she enthusiastically accepted. “I wanted to try it out because it is a molecular biology lab and I was interested in molecular biology since high school,” she continues. While not studying and researching, Chatterjee also finds time for community service. She serves as master of ceremonies and service co-chair of the professional chemistry fraternity, Alpha Chi Sigma. Additionally, Chatterjee tutors refugee children for the Young Scholars through the Office of Engagement Programs on campus. After graduating next May, Chatterjee is interested in continuing her epigenetics research at a graduate school. Raina suggests her passion for research will take her far, “Snigdha is one of the most dedicated, committed and organized undergraduate students I have had in my lab. She is very passionate about research,” he says.